I remember many years ago when I first visited New Orleans, Louisiana, my brother took me out to a local tavern. It happened to be a Friday evening and when we walked in the front door I saw the entire length of the bar covered with newspaper. In front of every patron was a big heap of boiled crabs atop the newspaper and scattered among them some boiled red potatoes and corncobs. There was an aroma in that place totally unlike the stale beer odor one frequently encounters in such habitats. That spicy seafood bouquet was marvelous. Unfortunately the kitchen was shut down. I’d never seen whole crabs that close up before, but the pleasing zesty fragrance made me want to try it soon. When they boil crabs, as well as shrimp or crawfish, they use special seasoned water to cook them. The water contains lemons, bay leaves and a wonderful commercial product called Zatarains Seafood Boil. In season, there are unique mobile seafood boilers that are driven up to a location to make this lovely repast for large groups, who sit at communal picnic- type tables. I was reminded of crabs when last month I dined at a seafood restaurant in Indian Rocks Beach Florida; a place called Crabby Bill’s. Weirdly enough, I didn’t order crabs. I’ve had crab cakes at Pensacola Beach that were fabulous, but I hadn’t eaten Oysters in years so I ordered them. My BW was eating a special broiled shrimp over seasoned rice. As I looked around I saw a waiter (oops, excuse me, a Server) deliver a taglietelle or fettuccine dish with crabmeat a few tables away. coming back from Crabby Bill’s. I buy slightly more than a pound and decide to make a pasta dish with it. It’s easy to fix, very delicious` and we both devoured it heartily. Cook the pasta as per package directions. Don’t overcook. While the pasta cooks, fry the scallions in the butter briefly. Add the tomatoes, salt and pepper and thyme, stir and cook for two minutes. Add the crabmeat and mix until heated. Stir in the cream and egg yolk combination. Pour the mixture over the cooked and drained pasta. Dish out the pasta and sprinkle with the parsley. This is an uncomplicated, tasty dish. My spouse and I loved it. If you like crabmeat you’ll enjoy this creamy, sumptuous preparation. Download a coloring page from http://educationtipster.blogspot.com/ for the book, “Sh Sh Sh Let the Baby Sleep.” Color it, and email a picture of it to Kathy Stemke at dancekam1 (at) yahoo (dot) com for a chance to win one of the prizes below. It sounds like a great recipe! Ooh I had something similar once. It tastes divine. Yummm, crab and pasta sounds delish. Now this has potential. I love these kind of seafood dishes. Fettuccine is a favorite here. I'lll give it a try. Thanks! My husband would like that. I'm a vegan, so none for me. sounds a looks delicious! Must try soon. We often do a crab/shrimp boil and dump the whole thing on the picnic table in the back yard. Around here we call it a 'low country boil'. The book looks like fun! This sounds absolutely delicious!! I love crabmeat, pairing it with pasta is a fantastic way to enjoy it. Bookmarking this one to make soon!! Thank you for your comments on my blog about the kapoma and I'm so glad you tried the sauce first. I too was worried about the amount of cinnamon when it was introduced to me but have since fallen in love with it. Cheers and happy blogging! Sounds wonderful. I don't think you can go wrong with crabmeat and pasta. My husband once ordered it at a place in Italy and I thought it would bring him to tears! 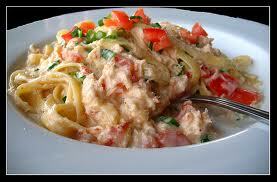 Awesome creamy crab pasta---such a comforting meal! Yum!! Your crab and pasta dish sounds amazing. I'll have to try it really soon. Thanks too for your comments on my blog about Peaceful Waters Sanctuary. It makes us so tranquil just walking the boardwalk. As for bagels we are lucky to have a Manhattan Bagel shop that makes very good bagels so I save the Plugra butter just for breads when I can really taste the flavor. It is expensive so I use it sparingly as a special treat. Oops I forgot to thank you for your suggestion of adding the lemon zest as well as the juice. You are right the essential oils in the zest give it so much more of that lemony flavor. I can't promise not to pass this on to Bobby though. You know he never really wanted there to be a winner or loser when he presented the Throwdown idea to Food Network. This sounds amazing. I have a husband who is allergic to seafood, but I absolutely love it. I am going to have to keep this one on hand for a time when I visit my parents (also seafood lovers).